True story–I’m in the very rubbery smelling “waiting room” (if you can call it that) of the Costco tire center right now. Searching for a treat to make that satisfies that line between heart-attack-by-chocolate-cake and semi-satisfying-chocolate-chip-granola-bar. Usually the latter just leaves me hankering to walk down the street to DQ for our 87th Blizzard of the summer. Chocolate alone is not going to do the job. There has to be some kind of indulgent textural element to a sweet for it to really hit the spot. Spongy chocolate cake, fluffy buttercream icing, thick and creamy cheesecake–the common thread is not just descriptive adjectives, but the characteristics described by said adjectives. You know it when you taste it, and typically it’s a missing element in even a homemade chocolate chip granola bar. Oh, and to be especially difficult, I want something quick. And easy. 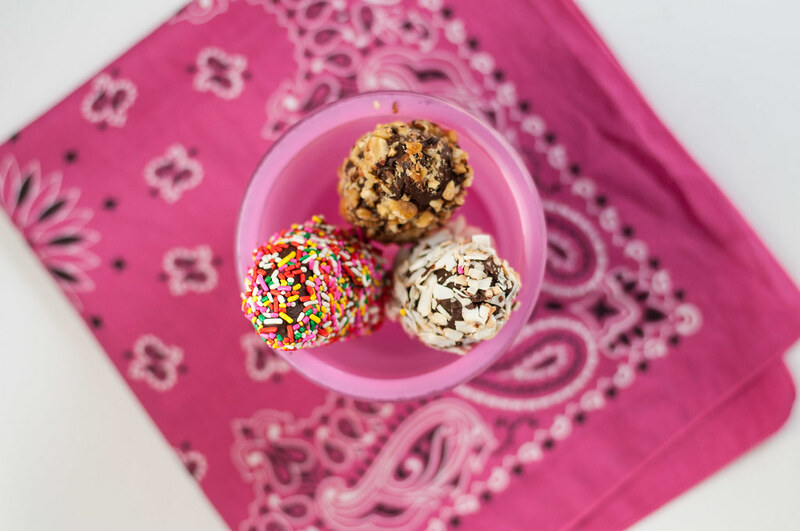 A frozen treat might do the trick, but I’m still pining for that ice cream maker. What about bananas? I have a couple sitting on my countertop right now. 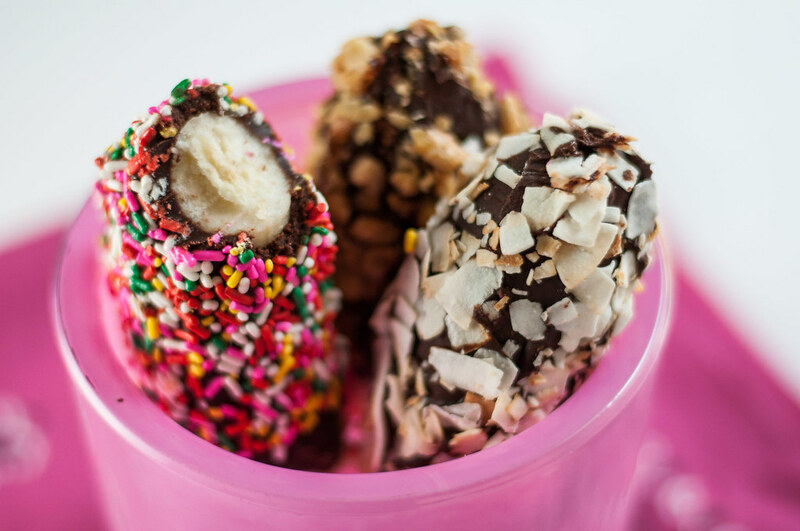 Somehow, 10 minutes later, after this whole dessert/treat train of thought began, I’m perusing Pinterest for chocolate covered banana pops, but they all call for plain old melted chocolate. I want something richer. Inviting peanut butter to the party sounds like a good answer, but will it set? Does peanut butter ganache set? Why did I just use the words “ganache” and “easy” in reference to the same recipe? Ganache, luckily, only sounds fancy. I happen to also have a little experience with adding peanut butter and it will, in fact, set. So here we have it. Peanut butter and heavy cream to provide that crucial rich dessert element and also soften the shell a bit, so I don’t end up with shattered bits of chocolate everywhere upon biting into one of these babies. Flash forward a few hours. I escaped the tire center and whipped up a batch of these for after dinner. 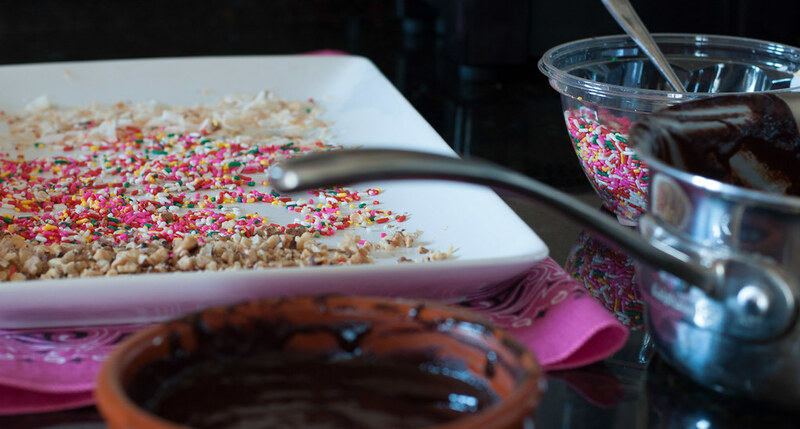 The really fun part was coating the pops in any topping around the kitchen–nuts, sprinkles, coconut…bacon. If you have bacon lying around, and sadly I did not, please try rolling one in maple syrup and bacon bits and send it to me on dry ice. In my head, there’s also a caramel drizzled version, but I didn’t feel like whipping up caramel sauce at this juncture, considering I’m the only one in the house who enjoys this sticky, impossible-yet-possible-to-dislike delight of melty, gooey sugar. 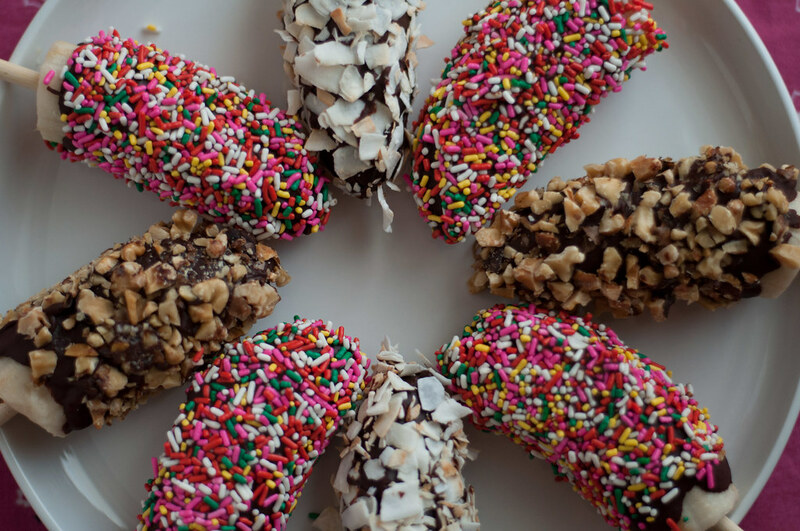 It’s pretty easy to impress Steve (and probably your children, nieces, or nephews) with anything coated in sprinkles. There was a lot more of these to love, though. Using ganache and peanut butter really did work to soften the coating, so even right out of the freezer, you’re not sinking your teeth into a shell that’s almost as impenetrable as a Nature Valley granola bar (rock-like, no?). You just get a nice, smooth chocolate shell with a hint of peanut butter, and the frozen banana takes on a creamy texture as it melts in your mouth. Basically, you need to experience these before summer is over, and I promise, given the ease of the recipe you won’t even know you just conquered chocolate ganache-making. 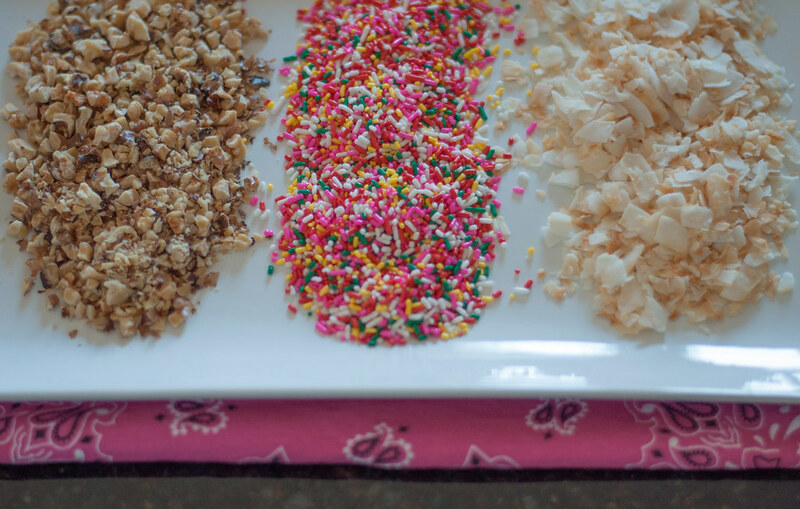 Toppings (optional): shredded coconut, chopped nuts, sprinkles, or whatever you can dream up! Peel the bananas and chop off the gross little end. Cut each banana in half crosswise. From the cut end, carefully insert a stick into each half, trying to get it most of the way through but not poking out the end. The banana may crack on the side slightly, but the chocolate will cover this later. Place in a dish, on waxed or parchment paper, in the freezer for a couple hours. Less freezing time may work, but I didn’t try it. Cold bananas will help the ganache set more quickly (so you can eat it more quickly). When you’re ready to finish the bananas, place your topping(s) on a plate or platter without a rim for easy rolling. In a small saucepan, heat the cream over medium until small bubbles form around the edge and it breaks a slight simmer. At this point, turn off the heat, then add the chocolate and peanut butter and stir, stir, stir! It will take a minute or two, and if you haven’t made ganache before you’ll think it failed, but the cream and chocolate will melt together and become shiny. 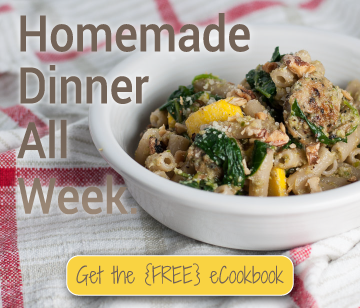 No need for a whisk–I used a spoon. The ganache will stay liquid for a while, so you don’t have to be in a huge rush during the next step. Hold each banana over the pan and spoon ganache all over it. Then use your spoon to scrape off the excess as you hold the banana upside down. 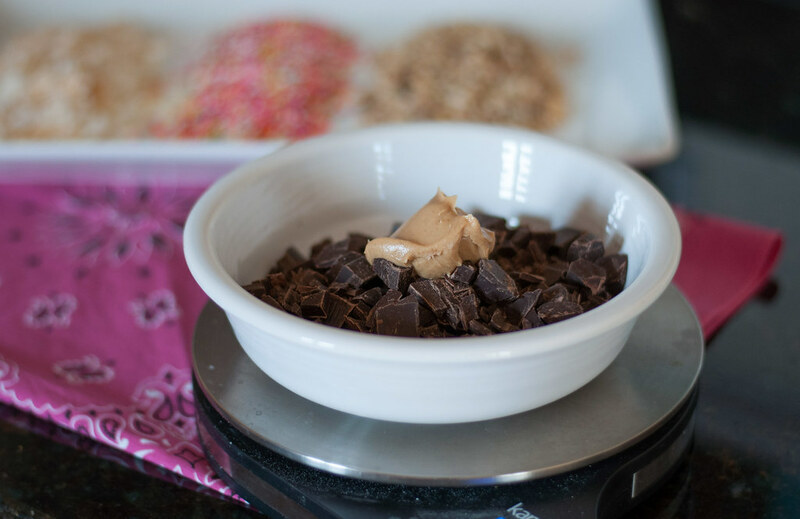 This will prevent lots of chocolate from getting all mixed in with your toppings. 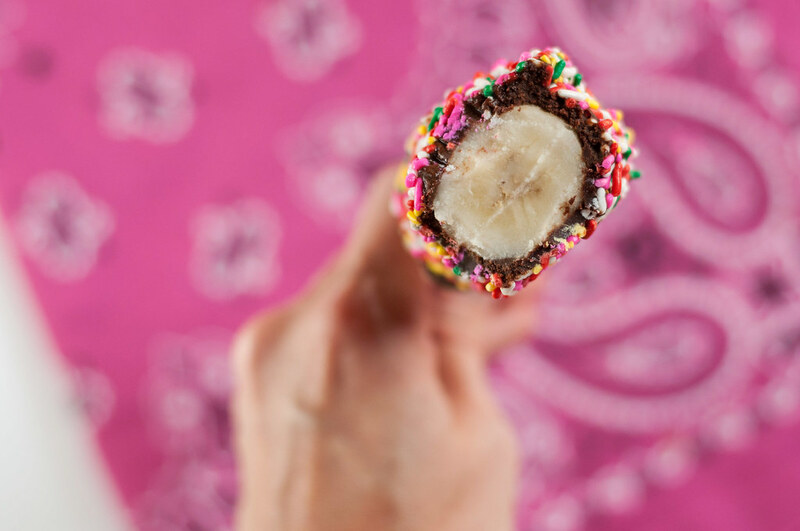 Lightly roll the coated banana in your topping of choice (spooning the toppings over it, if it’s easier). Lightly pat the toppings onto the banana if they’re not sticking. Shake off any excess toppings, then lay the banana back in the dish you froze it in. Repeat the process with the remaining bananas. Put back in the freezer until the ganache has hardened completely, only 10 minutes or so. After doing the first four bananas, they started to thaw, so I put the whole tray, including the ones I already coated, back in the freezer for 10 minutes. During that time, the ganache stayed liquid. 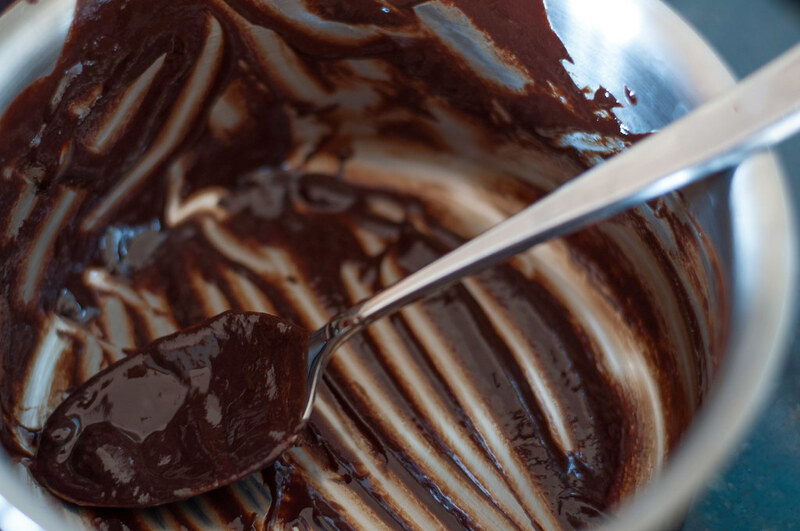 If your ganache does firm up, just heat it over the lowest heat, stirring, until it liquifies again. O MY goodness!! These look amazing!! I will be sharing this with my fans! !